Destroy target nonwhite nonblack creature. 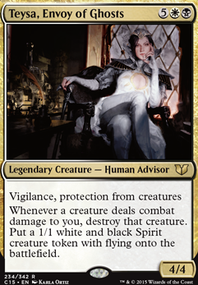 Put a 1/1 white Spirit creature token with flying into play. When the creature Seize the Soul haunts is put into a graveyard, destroy target nonwhite nonblack creature. Put a 1/1 white Spirit creature token with flying into play. Considering the Haunt mechanic requires you to exile your creature or spell upon entering the graveyard, you may want to remove all of those. That accounts for at least 19 creatures from your list which would bring you down to 116 cards. 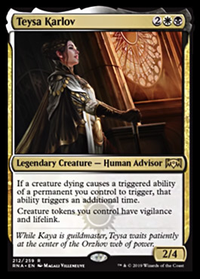 You can also replace the Orzhov Guildgate for a Bojuka Bog to hit an opponent's entire graveyard. 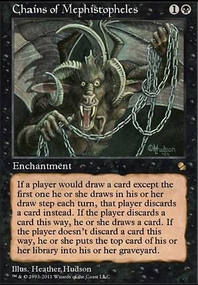 Since you also wanted to steer away from the Extort mechanic, you can remove those as well, along with noncreature spells with Haunt like Benediction of Moons , Cry of Contrition , and Seize the Soul . Theses suggestions might help to trim the deck down. 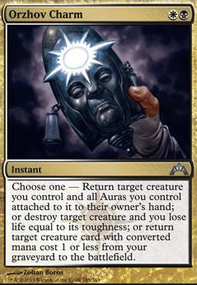 Also, I doubt that this could be an option but I know an interesting card that can synergise well with this deck. It can be used to trigger Torrential Gearhulk and Reflector Mage abilities. This Momentary Blink can actually be a counterspell through Torrential Gearhulk, if you choose Unwind or Rewind, it actually untaps more lands than you've used. That's very helpful to cast a full powered Sphinx's Revelation at your opponent's endphase. Now the first card I know I am not getting rid of is Path to Exile, It does come in use but either dosent pop up enough to be useful (Maybe I should add 2 extra) or I already have managed to get 30, 2/2 tokens with flying and vigalance, so it dosent seem to make the biggest difference. Selfless Spirit does become kinda useless if I get him any other time I am not doing the finisher, sacfificing him to make all of my creatues invincable usually ends in me winning that turn, or the next one. But other then that there is not really any other time he becomes useful. Geist-Honored Monk- Would Replace Seize the Soul. He is higher mana cost but could be a goot finisher, maybe replace Selfless Spirit. Hey, I saw your comment, I have to agree, for spirits, Lingering Souls is such a powerful card its a bummer not to have it in my Blue/White Spirit Deck (http://tappedout.net/mtg-decks/modern-deck-spirits/#c3134843. Anyway, my only suggestions might be Divinity of Pride, Seize the Soul, Devouring Greed, or Intangible Virtue. Besides from that, nice deck. UBQRLQL Seize the Soul, Lifebane Zombie, Nightveil Specter are all the options of a desperate man. The fact that we're even considering these cards for Merfolk goes to show how close the matchups can be. Although, I will say that double Desecration Demon is very very good. I almost want to play Bile Blight, but it's really bad against Death's Shadow and Thought-Knot Seer decks. I don't even know what I'd cut for it. I take out 2 Rats, 2 Shadows and Erebos for 3 Damnation, 1 Brutality and 1 Pithing Needle. Although we play our own Mutavaults, shutting down the enemies' or Aether Vial can be huge (I ignore it most of the time as well though..). I totally agree with you on every part you pointed out although I don't think Nightveil Specter does a good job. I even took Seize the Soul into consideration but decided it's not worth the slot. Trying to race the Fishies is not too bad especially with Islandwalk on our Mutavaults. But I don't play Lifebane Zombie and won't in near future. I have nothing to add since you pointed out the most important problems against Merfolk. Islandwalk, Cantrip (Spreading Sea, Adept), redundant lord effects and counterspells combined with a low curve can be very scary.